Sitting in the middle of the shelf, somewhere between bulletproof hard cases and the wafer-thin silky sleeves, is this leather-ish offering from iSkin. It may not offer the same level of impact protection, or foldaway convenience of the others, but it's a smart case nonetheless. iSkin generally makes good quality products and this case is no different. 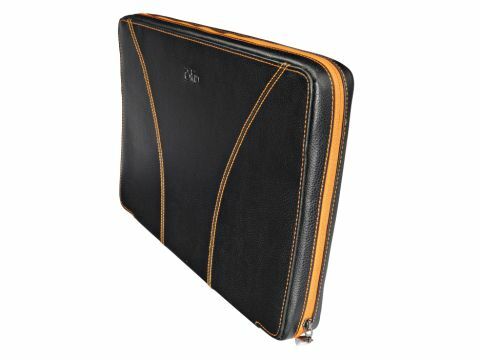 The outside is black faux leather (other colours available) with strong, bright orange stitching, while the interior is orange and felt lined. It feels luxurious and is strong, too. Inside, two felt covered elastic straps hold the Mac in place. It fits a 15-inch MacBook Pro but does well with a MacBook, too. There are no pockets at all anywhere on the case, and only one zip lock which you hope doesn't break. The SOHO case should be available through MacHeaven's UK store soon. Expect to pay a little more than average, as iSkin always charges towards the top end of the market. The US price is $60.